James Joyce (1882–1941) was born in Dublin, Ireland. 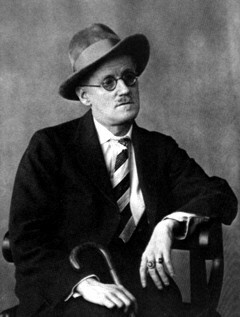 From the age of six, Joyce was educated by Jesuits at Clongowes Wood College, at Clane, and then at Belvedere College in Dublin. Later he thanked the Jesuits for teaching him to think straight, although he rejected their religious instructions. In 1898 he entered the University College, Dublin, where he found his early inspirations from the works of Henrik Ibsen, St. Thomas Aquinas, and W. B. Yeats. Joyce's first publication, an essay on Ibsen's play When We Dead Awaken, appeared in Fortnightly Review in 1900. At this time he began writing lyric poems. After graduation, Joyce spent a year in France, returning when a telegram arrived saying his mother was dying. Not long after her death, Joyce left Dublin with Nora Barnacle, a chambermaid whom he later married, and traveled around Europe, eventually settling in Trieste, Italy. There Joyce wrote most of Dubliners, all of A Portrait of the Artist as a Young Man, and large sections of Ulysses. In 1907, Joyce published a collection of poems entitled Chamber Music. In 1909, Joyce opened a cinema in Dublin, but this affair failed and he was soon back in Trieste, broke and working as a teacher, tweed salesman, journalist, and lecturer. In 1916, Portrait of the Artist as a Young Man, an autobiographical novel, was published. At the outset of the First World War, Joyce moved with his family to Zurich, where he started to develop the early chapters of Ulysses, which was first published in France because of censorship troubles in Great Britain and the United States. In 1923, Joyce moved to Paris and started his second major work, Finnegans Wake, which occupied his time for the next sixteen years—the final version of the book was completed in late 1938. After the fall of France in World War II, Joyce returned to Zurich, where he died on January 13, 1941. Finnegans Wake was the last and most revolutionary work of the author.